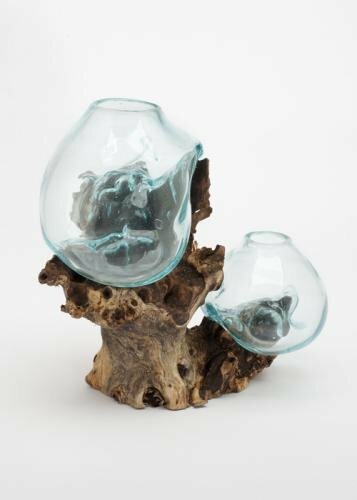 This beautiful piece features two glass pieces blown onto the wood root and they are one of a kind and totally unique pieces This piece is approximately 12 inches wide and 12 high. Each piece begans with a piece of a wood root and then a skilled artisan, who has a love and an eye for the art of glass blowing, begins blowing the molten glass onto the shape of the root glass begins to flow and cradling the form of the wood, until the artisans makes it into a two glass vessel that can be filled with items of your own imagination. No two pieces are alike because of the variances in the wood and we can only show you a picture of what some have looked like and you get a bit of a surprise, and delight, when yours arrives. The hand blown glass is made of 100% recycled materials. The bowl can be used as a terrarium or a vase, and some like to use it for a fish bowl. However you put this wonderful piece in action, you are going to receive rave reviews. We are showing you some pictures of what others have done with their sculptures. Each glass vase holds approximately a pint of liquid... may be a little more. Approximate size is 12 inches tall x 12 inches wide.